The mother a 13-year-old girl has been unable to get Facebook to remove a photo that her daughter and a 12-year-old friend were tricked into having taken, which is being used to promote the violent neo-fascist group Britain First. 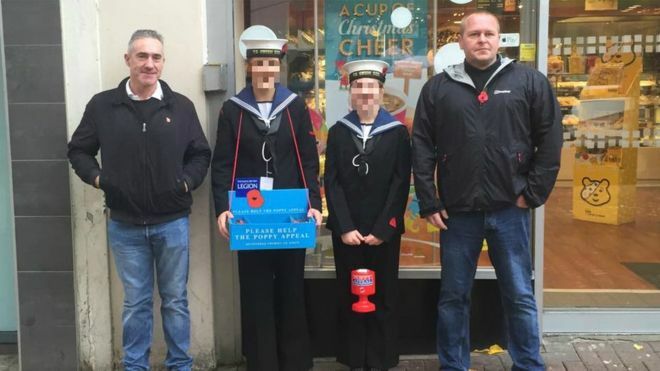 The girls were selling poppies for the Nottingham Sea Cadets when two men they didn't know asked them to pose for a photo with them. The men were activists for Britain First, and subsequently posted the image to Facebook to promote their cause, which includes a programme of ethnic cleansing in the UK. Both the Nottingham Sea Cadets and the girls' parents have contacted Facebook to have the photo removed, but the service will not respond to them. "As a parent, knowing an image of your child is being seen and shared around the country without your consent is frightening especially when it's linked to a controversial group whose views you do not agree with," said the mother. "Potentially they could make your child a target to the fools out there that exist." She has not received any response from Britain First, who she described as "cowards" and "racist bullies". The BBC has asked Britain First to comment but it has not responded.